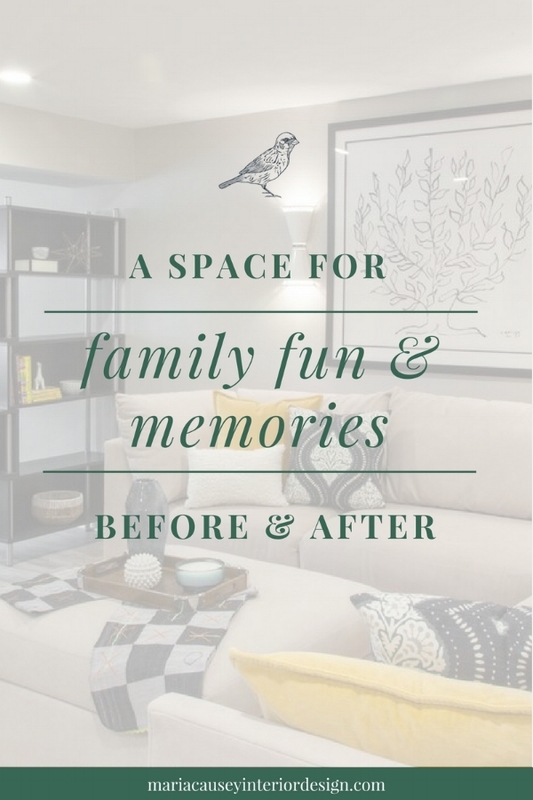 The original space was dark, well-worn, and took a slightly awkward “open concept” approach to the family and exercise areas. Our client wanted separation between these two areas, but she also knew that putting up a wall would block the natural light from the window. We had a solution! AFTER: Family Room Turns Fun & Bright! This pre-built shelving unit is the perfect way to divide the room AND preserve sunlight. To keep the shelving unit looking cohesive with the space, our contractor expanded the existing column to make the shelves appear built in. We also added a checkerboard-patterned throw blanket to the couch to subtly incorporate the shelving unit into the rest of the room. PRO TIP: Most LVT is waterproof, as well as dent, scratch, scuff, and stain resistant. This makes it a great option for high-traffic areas — like a family room, home gym, or kids’ playroom! 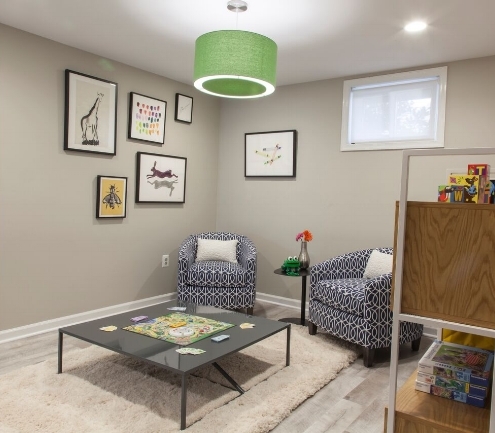 ...but she also wanted it to be a space in which she could pass time with other parents. There is also plenty of storage space — another win! Before, you can see this bathroom took quite a beating from the daily barrage of kids… and cats… and more kids. The lighting itself isn’t great, but the tan wall paint and opaque shower curtain make the room seem even smaller and darker. 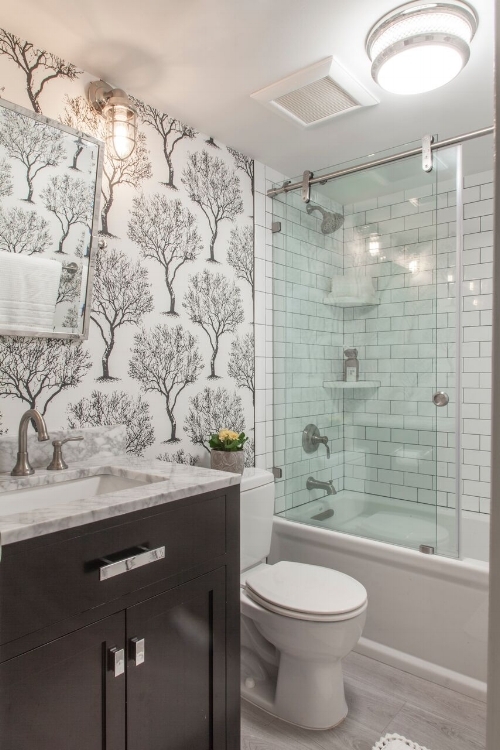 Subway tiles in the shower are a stylish trick for creating visual width! A well-designed space has the power to change the way people live. Especially in an age where technology seems to create more distance than closeness, it's uplifting (and incredibly rewarding) to see that interior design can bring people together. This kind of impact is more meaningful to us than any words of praise, and we're happy to have played even a small part in this family's story. We wish them many joyful memories in their new space! Ready to change how you live? Let Maria Causey Interior Design personalize your space. To receive more information or a proposal for your next project, contact us today.